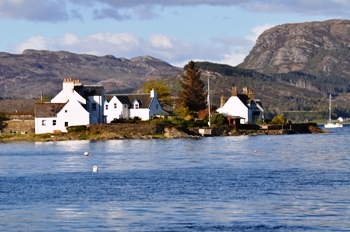 Plockton is a delightful town on the banks of Loch Carron in the West Highlands of Scotland, with stunning views of the Loch and surrounding mountains its popular with artist and photographers from all over the world. This Highland Community once relied on Fishing and crofting after the Highland clearances. Now a national Trust conservation village it is now populated by many tourist and a small community of fishermen and pleasure boats. The setting is magnificent, surround by beautiful hills and mountain scenery, with a lovely seafront setting for you to take gentle walks across the harbour or lovely restaurants and cafes to try the local cuisine, also available are small general stores a fish and chip shop and a few pubs and hotels. The village found more fame due to the popular TV series Hamish Macbeth that used the village for the filming; the village also featured in the film The Wicker man. The location of the village of Plockton is an ideal base for exploring the Isle of Skye if you prefer to stay on the mainland, and Eilean Donan Castle is also close by as well and also the Five Sisters of Kintail if you would like a walking holiday. Also not so far away is the mountain road to Applecross named , Bealach na Bà one of the steepest roads in the UK with hairpin bends that only the experienced driver should tackle this is located on the other side of the Loch after the town of Lochcarron. Wildlife in the surrounding areas of Plockton are abundant with Pine Martens, Deer, and many bird species, The lochs are inhabited by many seals, porpoises, otters and the occasional Dolphins are spotted in the surrounding waters. You can take an excellent boat trip around loch Carron from Plockton with calums seal trips, a great boat trip with an excellent crew. Rowing boats can also be hired from plockton if you prefer to venture onto the loch yourself. There are lots of good walks around Plockton especially the brae walk that’s recommended or a walk up to the TV mast on the hill; another enjoyable walk is the lochside walk to Duncraig Castle, the village is also close to Craig Highland Farm where you can view some rare breeds including llamas, the farm is also a nice place to stay and rents cottages and cabins close to the Loch and within the farm itself, Just off the shore from the farm is also an island that is a Heron sanctuary and the views from this area across loch Carron are spectacular. Recently staying on this farm In one of the cottages I was visited by Pine martens every night on the window ledge, something I will never forget.